In March 2012, a National Geographic Pristine Seas team, in cooperation with the PEW Charitable Trusts, undertook a month-long expedition to determine the health of the marine environment surrounding the four Pitcairn Islands. Over the course of the expedition, the team of top marine ecologists and filmmakers made 384 dives, spent more than 450 person-hours underwater, and counted and measured thousands of species of fish, coral, and algae. 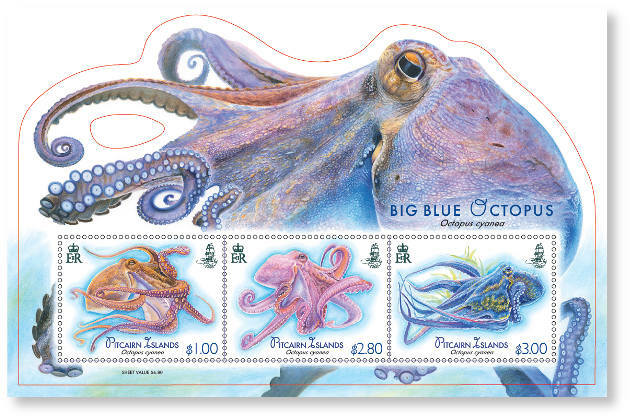 They identified one species of octopus - Octopus cyanea, also known as the Big Blue or Day Octopus, which occurs in both the Pacific and Indian Oceans. Like squids and cuttlefish, the octopus is a cephalopod which means it has a large head and many arms, or tentacles. Big Blue Octopuses are commonly found in coral reefs at depths of 1 to 100 metres, living in muddy, sandy, or rocky bottoms, and in seagrass beds. They create lairs or dens in crevices or coral rubbles within coral reefs. These dens are only used on average for a period of 35 days. While most species of octopus are nocturnal, O. cyanea is diurnal, being active at dawn and dusk. Living as it does on coral reefs, and hunting by day, it is adept at camouflage and not only can change colour frequently, but also can change the patterns and texture of its skin. As it moves across the seabed it makes changes in its colouring and appearance to match the substrate beneath. The colour changes are instantaneous and made by chromatophores under direct control of the brain. This octopus sometimes produces a "passing clouds" display when stationary near prey such as a crab. These mimic a dark shadow passing across its surface and may encourage the crab to move to its detriment. During the day, it walks or swims over the reef as it hunts. Though it doesn’t have bones, it is almost all muscle and uses its tentacles to catch its prey. The suction-cups on its tentacles make it almost impossible for its prey to escape. The octopus is a strong and aggressive predator, hunting for small fish, crabs, shrimp, and molluscs. Small items may be eaten where they are caught, while larger items are carried back to the den for consumption. Crabs may be killed by a bite and given an injection of toxic saliva, then chewed up in the beak of the octopus, while molluscs may have their shells drilled and the animal inside is pre-digested to ease extraction. Empty mollusc shells and crab carapaces are discarded outside the den, forming a midden. O. cyanea grows to 16cm in mantle length with arms to at least 80 cm and up to 6.4kg. Its growth curve is nearly exponential and it converts its prey into new growth with an efficiency greater than 50%, relying on protein for growth, energy production, and energy reserves. The life of Octopus cyanea is short-lived, surviving from 12–15 months and breeding only once.